I used code 3YGFM (existing customer) got extra £20 off! I used code 3YGFM (existing customer) got extra £20 quid off! If you use a code that hasn't been specifically sent to you they will just charge it back to you. I dislike Beats as much as the next person but the cold votes are really unfair as this is a genuinely good deal. Lucky to get the wired Solo 2 for this price never mind wireless. Thanks. Didn't realize these were £270 only in August of last year! Great find. I kinda like the colour too! Heat! Heat. 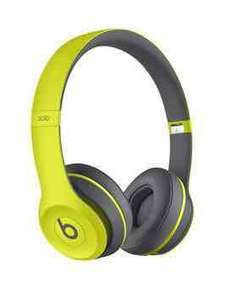 Daft as despite the beats hate these are still much cheaper than anywhere else! I'm mainly a Bowers and Wilkins man but now I've got a 7+ I've been quite happy with my Powerbeats 3 for certain music and scenarios. At this price it's got to be worth trying these as most negative reviews were at the original RRP being too high rather then the sound being awful. These garnered decent reviews at £270 only a few months ago. Surely a decent punt for a ton, unless the colour is a deal breaker . . Anyway; ordered for the wife to use whilst she is walking the dogs. Thanks op. These garnered decent reviews at £270 only a few months ago. Surely a … These garnered decent reviews at £270 only a few months ago. Surely a decent punt for a ton, unless the colour is a deal breaker . . Anyway; ordered for the wife to use whilst she is walking the dogs. Thanks op.